In “Mortgage Lending in Chicago and Los Angeles: a paired-testing study of the pre-application process”, Ross et al. 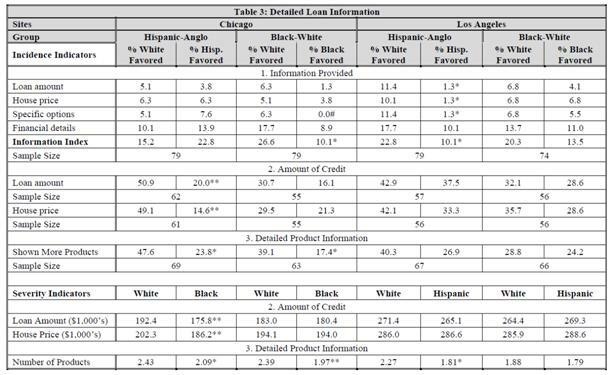 (2008) used paired testing to measure discrimination against African-American and Hispanic homebuyers in the mortgage lending process. Many studies have provided evidence that minority buyers are less likely to receive mortgage loans than white buyers and, if successful, receive less favorable loan amounts and terms. There is debate, however, on how much of this outcome can be attributed to discrimination. Due to differences in creditworthiness, it is not typically straightforward to isolate the effects of differences in racial and ethnic treatment. Most work done on the topic of race in lending has used HMDA data which does not contain many important lender and loan attributes such as credit history and lending ratios. Using data from a recent paired test study of discrimination in lending, Ross et al. examine the effects of race and ethnicity on mortgage lending. Using paired testing, two individuals, one white and one minority, separately pose as homebuyers with equal qualifications for borrowing. Both members of the pair ask about the availability and terms for the same home mortgage loan. Since the two borrowers are constructed to be equal in every regard other than race or ethnicity, differences in the responses received by the two can provide direct evidence for differing treatment of minorities. It should be noted that this methodology will only focus on the first part of the lending process, the pre-application stage (which involves a loan officer that can observe the race of the applicant) rather than the approval stage (with an underwriter who typically does not). The study included approximately 250 paired tests of a representative sample of mortgage lenders in Los Angeles and Chicago. Testers posed as first-time homebuyers with limited assets making general requests for information from lenders about their mortgage loan options. The testers were given profiles that qualified them for loans targeted towards A- credit quality borrowers in their respective housing markets. Each tester was assigned sufficient income to purchase a median-priced home in the area (with a 30 year fixed-rate loan and 5% down payment) and randomly assigned one or two minor credit issues, mostly late payments. Each pair was given almost identical financial and household characteristics with the minority in the pair receiving slightly better qualifications. These pairs, it should be noted, were not permanent—a tester could be paired with multiple partners if more than one partner was available that also generally matched in gender, age, and appearance. Table 1 below provides data on the lending institutions in the study. The study looked only at lenders that reported under the Home Mortgage Disclosure act, accepted at least 90 loan applications in 1998, and had reasonably located offices for a first-time homebuyer. 67 lenders in Los Angeles and 106 lenders in Chicago qualified under these criteria, and in order to draw a market representative sample, lenders were selected (with replacement) with a probability of selection based on loan volume. 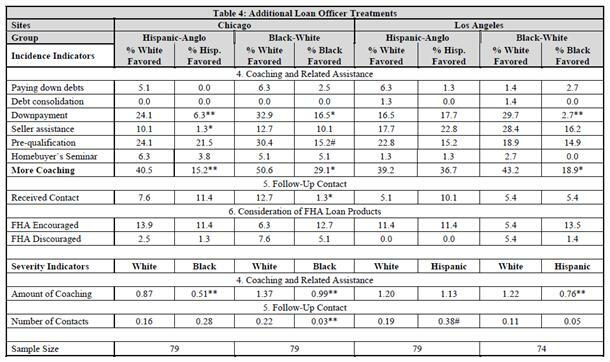 This provided 35 lenders for black-white testing in Los Angeles, 34 for Hispanic-Anglo in LA, and so on as indicated in the table. Exchange personal/financial information – testers provided all requested information on income, debts, assets, credit history, etc. How much were testers told they could afford to borrow and/or buy? How many specific products were discussed with the tester? How much “coaching”, such as offers of advice on paying down debts, down payment assistance, or a prequalification letter, did testers receive to help them qualify for a loan? Did testers receive follow-up calls from lenders? Were testers encouraged to consider FHA loans as an option? where the expected value (E) is captured by the sample mean of the difference of the two series of treatments. These two measures, Nt and St, are commonly used estimates of systematic discrimination towards minorities. Statistical tests are performed on these two variables to determine if they differ significantly from zero using a two sided test. While it would be very unlikely to find unfavorable treatment for whites based on past studies, the authors decided to use the two-sided test as it was more conservative. Table 5 below summarizes the patterns of findings. Significant differences between the white favored and minority favored are indicated, with * representing significance at the 5% level and ** for the 1% level. The last row of the table shows that in Chicago, Hispanics and blacks received significant differential treatment from whites in three and four of the six categories, respectively. For both minority groups in Chicago, this leads to a rejection of the null hypothesis of equal treatment for whites and minorities at the 0.01 level. In Los Angeles, the data taken as a whole is consistent with the null hypothesis of equal treatment. In summary, the paper finds strong evidence of adverse treatment of Hispanics and blacks compared to whites in Chicago in the pre-application stages of the mortgage lending process. In the study, Hispanics were quoted lower loan amounts and house prices, were given less information about products, and received less coaching. African Americans were provided less information, received information about fewer products, received less coaching, and were less likely to experience follow-up contact. Los Angeles, on the other hand, showed no statistically significant differences in overall treatment of its white and minority borrowers. While minorities received worse treatment in some specific categories, this was not indicative of an overall pattern in LA. Discriminatory treatment at this early stage in the mortgage lending process, though subtle,can have effects on the rest of the mortgage application. Minority homeseekers may be discouraged from applying for a mortgage due to their treatment by a lender, either abandoning their search completely or applying through the costlier subprime mortgage market instead. Also, loan officers provide more support and information to white applicants in certain circumstances which gives them a better chance of acceptance than a similarly qualified minority applicant. Federal law, through the Equal Credit Opportunity Act (ECOA) and Fair Housing Act (FHA), forbids credit discrimination and real-estate related discrimination. The results from this study show that discrimination in these aspects is an unfortunate reality for minorities seeking home mortgage loans. Further study could be done on the reasons behind the different levels of discrimination found in Chicago and Los Angeles in the study. This research could then be used to help implement policies and effect change on a broader scale to help fight against unfair lending treatments and practices. Stephen Ross, Margery Austin Turner, Erin Godfrey, and Robin Smith, 2008, “Mortgage lending in Chicago and Los Angeles: a paired-testing study of the pre-application process,” Journal of Urban Economics 63: 902-919. Tables 3 and 4 below provide information on the proportions of each test that were favored for white or minority testers.